Kaba, a worldwide manufacturer of access control solutions for over 140 years, and CoreStreet are partnering to build advanced, standalone electronic locks that enable convergence of physical and logical security systems. Using CoreStreet’s technology, Kaba will offer one physical access control system (PACS) to comply with Federal Information Processing Standard 201 (FIPS 201) and will be introducing another that works with CoreStreet’s patented Card-Connected technology. Both systems are currently in field testing and will be available early next year. WINSTON-SALEM, N.C. & CAMBRIDGE, Mass.–Kaba®, a worldwide leader providing access control solutions for over 140 years, and CoreStreet®, a leader in software for smart credential and convergence programs, today announced a partnership to build advanced, standalone electronic locks that, for the first time, enable true convergence of physical and logical security systems. Using CoreStreet’s technology, Kaba will offer one physical access control system (PACS) to comply with Federal Information Processing Standard-201 (FIPS-201) and will be introducing another that works with CoreStreet’s patented Card-Connected technology. Both systems are currently in field testing and will be generally available early next year. To increase the level of security across all government infrastructure, as required by Homeland Security Presidential Directive 12 (HSPD-12) and defined in FIPS-201, the Kaba E-Plex 5800 PACS is an electronic standalone locking system designed to provide physical access using FIPS-201 compliant smart cards. “A key goal of FIPS-201 involves the interoperability of credentials across logical and physical domains. Our collaboration allows FIPS-201 credentials to be used immediately across any federal enterprise and importantly extends the use of these credentials beyond the current range of electronic access control solutions,” said CoreStreet CEO Chris Broderick. Performing a public key infrastructure (PKI) challenge-response for strong card authentication. 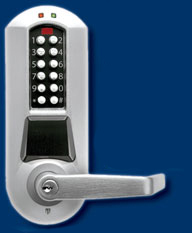 Once enrolled, FIPS cardholders access E-Plex 5800 locks as permitted by the access policy set in the head-end software. The locks are designed to replace standard door locks as an alternative to wired access points, making installation simple and cost effective. A key challenge with traditional standalone electronic locking systems is that they are not integrated with head-end PACS, and therefore must be managed separately with frequent visits by security personnel to provide access list updates. CoreStreet technology addresses that challenge by enabling the addition of standalone electronic locks to PACS, even in the most secure settings and leveraging cardholders to carry updates to the locks. In developing the Kaba E-Plex 5900 electronic locks with CoreStreet’s Card-Connected technology, users will centrally manage access points anywhere in the organization and cut the cost of electronic access control per door by more than half. The locking systems are managed and monitored in physical access control systems, just like wired doors, but require no wiring or wireless communication networks. The locks communicate with commercially-available physical access control systems by reading and writing digitally signed data (privileges and logs) to and from smart cards. In this way, cardholders become an extension of the physical access network where cards, instead of wires, carry information to and from the locks. Additional information on these products can be found at http://www.corestreet.com/solutions/prod_tech/card/ or by contacting CoreStreet at [email protected]. Kaba Access Control has provided strong, powerful security solutions since 1862. During its 145 year history, Kaba has grown into a technological leader in the security industry. Today, the Kaba group invests substantially in research and development to stay at the forefront of the industry’s technological leadership. Kaba’s global presence can be seen in operations in more than 60 countries with a dedicated workforce of 10,000 employees. Every day, the world’s most demanding government and commercial enterprises rely on CoreStreet technology to authorize critical events, ranging from signed communications and transactions to physical access. More information, including technical whitepapers, industry solution studies and a list of the patents awarded to the company is available at http://www.corestreet.com.